Elite Horizon is proud to present the very first affordable, practical and stylish pizza oven in the UAE. 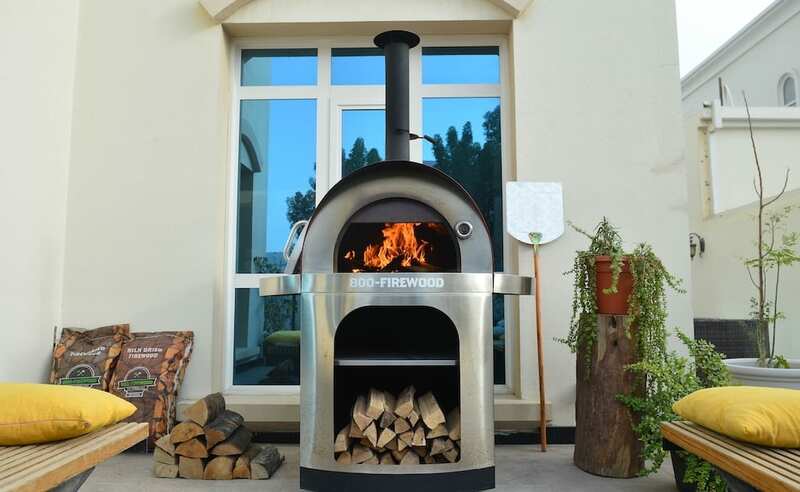 The Co-Branded 800-Firewood and La Hacienda pizza oven is made from beautiful stainless steel, with powder coated high temperature paint to provide an exquisite finish. The pizza oven is capable of reaching temperatures of up to 800 degrees Fahrenheit and has a cooking area of 715 Sq/inches. Weighted at 88kgs, we added wheels to ensure easy portability. Passion for design, passion for food, passion for life. The 800-Firewood / La Hacienda oven combines the performance of a traditional Italian wood fired and the exceptional style and design Italy is famous for. Superior functionality and superb craftsmanship will quickly make this oven your preference when cooking for two or cooking for twenty! Regardless of the cuisine, the results will impress all of your family and friends. 304 Grade stainless steel for extreme environments, 430-grade stainless steel for extreme temperatures. The oven can be used without the cart. Folding preparation shelf and retractable oven tool holder. Thick ceramic stone base, for perfect stonebaked wood-fired pizza. Cooking time approximately two minutes. The La Hacienda Pizza oven is designed to function as both a pizza oven and a smoker. For pizza purposes we recommend the use of Beech or Olive Firewood, to get the oven up to the highest temperature. For smoking purposes, we recommend using oak for the best flavor. The La Hacienda 800-FIREWOOD pizza oven is available in Dubai at the moment and can be ordered for international shipping, or delivered and installed locally by one of our experienced technicians. What’s more, the range comes backed with a 12-month warranty, for extra piece of mind.